The 35.5 metre motor yacht Tail Lights, listed for sale by Babb Rawlings at HMY Yacht Sales, has had a further $504,000 price reduction. Built in GRP by Italian yard Azimut to a design by Stefano Righini, she was delivered in 2011 as an Azimut Grande 116 model and recently had a full refit including an upgraded interior and a full exterior repaint. Accommodation is for up to 12 guests in five cabins consisting of a master suite, two VIP suites and two twins, all with entertainment centres, LED television screens and en suite bathroom facilities. In addition, the media room has a large sofa that converts to a double bed. The interior of the saloon, designed by Carlo Galeazzi, has wall panelling in cherry wood and ceilings in lacquered wood and fine fabrics. Guest facilities here include a bar to port, four settees and coffee tables to starboard and there is an entertainment centre including a 40-inch plasma television screen. Forward is a dining area with seating for 12 guests, storage for glassware, china and cutlery while further forward still, the galley has a leather upholstered settee for guests to enjoy relaxed breakfasts and casual meals. The aft cockpit of this yacht for sale offers built-in upholstered seating and a teak table seating 12 guests keen to enjoy al fresco cocktails and dining. The flybridge comes with three helm seats, a bar, Jacuzzi and a C-shaped settee around a teak dining table seating 12 and is sheltered by two electrically operated Bimini tops. Twin 2,400hp MTU diesel engines give her a comfortable cruising speed of 20 knots. 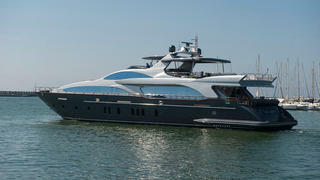 Lying in Fort Lauderdale, Florida, Tail Lights is now asking $7,995,000.